This forum is for discussion of Non-EV matters. Has this invertert got both usb and serial connector ?? I have got 3 of them (same model but only serial connector) in parallel with pip4048ms and I could flash firmware without problems. And laptop with W7 32bits. No problem with flash both firmwares (72,60b and 4.10). My inverters (heatsink up) are March 2014 and coming with 52.10 and 1.24 firms flashing to 72.60b and 4.10 last year. Last edited by Tejota on Sat, 17 Jun 2017, 00:58, edited 1 time in total. I have raised a case with MPP Solar for both the charging problem and the parallel problem. Lets see what they have to say. I wonder how long we will wait? Well the answer was prompt but useless. I will try again and see what we get. so we have some background information of the system. Regarding the issue experienced, I would recommend checking your AC input breakers (wiring issue) to see if they are undersized. we had customers reporting similar problems, and after readjusting their breakers & wires it became normal. James Ko ¦ Support Team, MPP Solar Inc.
> Hi, I recently purchased 3 x PIP4048 with Parallel kits. > I am having some technical issues. > If I set Mains charging to more than the default 30A it continually drops out of charge. The charge ramps up in the normal fashion but when it gets to about 37/38 amps it drops to zero and starts ramping up again. If I set the charge to 30 A then it continues to charge as expected. > I have been in contact with a few other PIP owners and there are experiencing the same problem. > In an effort to get a higher charging rate I installed the parallel kits and set up 2 units. Both came up correctly with MS and SL and both were able to supply the load from the battery. However when I connected AC. It recognized the AC as present but would not charge or supply the load from AC. The AC in was from the same source and the AC out was paralleled. > In the case of both problems no fault indication was present. > No Solar is yet connected (coming soon) so charging from AC is the only option. > As other users are reporting the same problems. I think it is unlikely to be just a faulty unit but more likely to be a firmware glitch. > The units have only been temporary set up to test and I am reluctant to fully wire and set them up if they are unable to do what is advertised. > Please advise a fix for the issues. Ian, can I suggest when you try mmp solar again, that you replace the multiple "its" with PIP4048. It has been my experience that our sentence structure and usage don't always make sense to ppl that don't have English as a first language, or learn "American English". I will add to Roberts use Grid or Generator not AC look at what terms they use in the hand book. Also do not use other abbreviations F/W and do not write long sentences. Last edited by paulvk on Mon, 26 Jun 2017, 17:03, edited 1 time in total. The index to this topic on page 1 has a link to the instructions/download for the latest patched firmware (currently what we're calling 72.70b). If you are after official firmware, it's in the .zip file as dsp_original_72.70.hex. Copy over the top of dsp.hex to flash load it. I've just (Sunday) upgraded the firmware in my 2x Parallel PIP-4048MS inverters. Nice to finally see the inverters go into Absorb mode! So thanks for the fixed firmware!! Last edited by ejb on Tue, 11 Jul 2017, 10:08, edited 1 time in total. Last project day Weber and I started repairing his PIP-4048 which had blown its battery side MOSFETs. Experience has shown that when this happens, other parts driving the gates tend to fail as well. It helps to have a schematic for these, so we traced out the following back to U9. To see in full detail, you may need to use your browser's controls, such as View Image or Open Image In New Tab. Many parts of this schematic are repeated, as indicated by the coloured rectangles. For example, transformer TX5 has two seconary windings; the other winding connects to another gate driver for the MOSFET at the opposite corner of the full bridge. The B output of the PWM chip connects to another set of transistors, which drive transformers TX8 and TX11. TX8 has two secondaries that connect to two gate drivers for the other corners of the full bridge on the battery side. Last edited by coulomb on Wed, 26 Jul 2017, 07:58, edited 1 time in total. While I'm in a partial schematic posting mood, and also Maxo on the South African Power Forum is having trouble with this power supply, I thought I'd post this partial schematic trace that it seems I hadn't posted before (belatedly for Maxo, unfortunately). 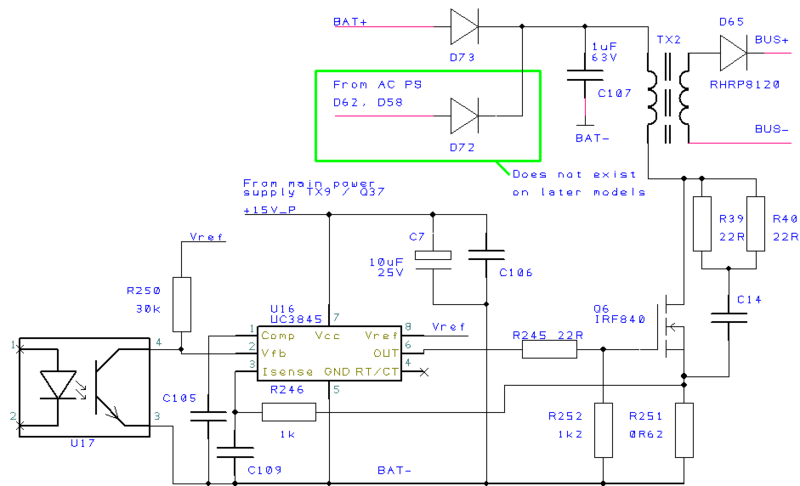 As usual, use your browser's controls (View Image, Show Image in New Tab, etc) to see the schematic in detail. Edit: It seems that this power supply is simply not present in later models; this trace is from a 2013 model. This may explain why earlier models could run the LCD display and update firmware with utility power but no battery. Edit: Redrew schematic to make it clearer. Edit: Added Q63 and associated parts. Edit: Various corrections, e.g. ZD15 is 12 V.
Last edited by coulomb on Wed, 26 Jul 2017, 18:04, edited 1 time in total. 1800UF 80VDC 105C UCC 10,000 HR ELECT.CAPACITOR the decided best option on the PIP4048. Had some old blank pcbs I could use.Paralleled caps to get value .They all came in when measured above 3300uF.I mounted caps upside down on a PCB and screwed to some unused heatsink holes and wired them to mother board or main board. Do we know how thick wire should be Cap.pcb to mother board.Any idea of series DC current the 3300uF'sor 1800// sink? ( ..not to sure where caps. are in the Battery charge circuit ? Do you/we think this is sufficient? Using caution thanks -ready to restart PIP. Do not restart your PIP. You can't position the capacitors any further away from the MOSFETs than the original ones were. It doesn't matter how thick you make the wires, they will still have too much series inductance, which will stop the capacitors from doing their job, by making the total impedance too high at high frequencies (i.e. during fast switching transitions). And you do not need to have the same capacitance as the original. So you do not need to parallel two of the 1800 uF to replace one 3300 uF. As I mentioned here: The impedance and ripple current ratings are what matter in this application. The actual capacitance is irrelevant. So you must simply solder one 1800 uF United Chemi-Con capacitor directly in the place where each 3300 uF Jamicon capacitor used to be. Here is the schematic trace for the final "power supply". It's actually the Bus Soft Start circuit, which Weber and I previously thought was done by slowly increasing the pulse width of the main DC-DC converter. This shows that while TX2 and TX6 look similar, they are quite different in operation. When enabled by the DSP, this power supply will charge up the two 470 μF capacitors on the higher voltage bus (usually about 8x the battery voltage, 336-480 V). I also updated the schematic trace for the primary power supply. Unlike most of the other power supplies, the primary power supply can only be disabled by the processor. The reason is clear; otherwise, you'd have no way of starting the machine! But the fact that it can be turned off under processor control answers another mystery that has been bothering me. When the power switch is off but there is power from the SCC, it seemed to me that the processor always should have power. But it can sense the power switch, and after a half minute or so delay, the LCD light goes off and I can't seem to talk to it. I'd say it's because it's sensed the power switch is off, and after shutting things down in an orderly manner, switches off the main power supply via opto U8, which will kill its own power. Earlier models used to be able to keep running from mains power, via the utility power supply involving TX6 (schematic trace a few posts earlier). But that power supply doesn't exist on later models, so turning off the power switch really does end up powering down the inverter. It never seemed to be consistent to me, but now I know why. My experience was based on a mixture of older and newer models, which actually behave slightly differently. Last edited by coulomb on Tue, 25 Jul 2017, 06:49, edited 1 time in total. Thanks Coulomb! You have done a great job of enabling suitably-qualified people to repair their own PIP-4048MS, or equivalent Axpert, by tracing, drawing and posting these schematics for the sections that most often fail. I will be an expert at pulling these PIP'S down.Two more pull downs and two re-assembles to go. By the way Paulvk and I have put two external 120mm 240Vac fans(running from 240VAC O/p) at top cooling exists with temp.controller probe on Batt.side of heat-sink set to come on at around 39C .It runs super cool now which should extend life of all components in PIP.Hope this helps PIP users and the digital temp LED readout gives immediately heads up situation operation during charging. Thanks again Weber -will post when Ive done the cap mods. on them and restart. I recently invested in these two tools, which greatly speed up the PIP upgrade or repair process. Is that a soldersucker? And the Rolls Royce version at that? This unit by the look of it https://rhinotools.com.au/product/desol ... n/#reviews love the fact there are lots of spare parts available and the less than perfect reviews were quickly addressed. Their cable lugs are well priced too, have been a customer of theirs for quite a while now. Last edited by weber on Tue, 25 Jul 2017, 12:13, edited 1 time in total. 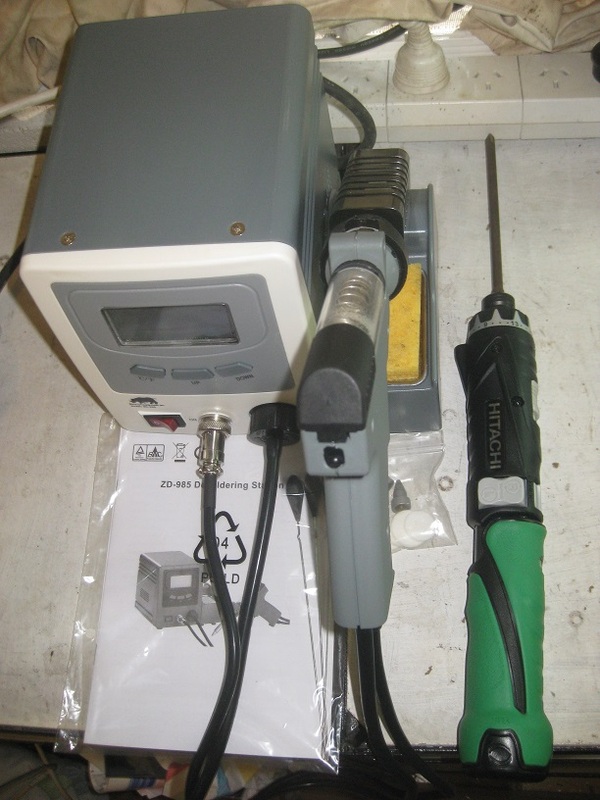 Yes that's the Rhino Tools ZD-985 desoldering station and the Hitachi DB3DL2 cordless screwdriver. I looked at many online reviews before settling on both of these. And so far, I'm very pleased with both. It's "Rolls Royce" (or should we be saying "Tesla Motors"?) compared to my previous -- the kind where you have to have a muscly thumb to keep reloading the plunger, and lightning precision and coordination to whip the soldering iron out of the way and jam the nozzle in the right place and simultaneously hit the release button. But it's not "Tesla Motors" compared to other desoldering stations that cost 3 times as much. It's merely the best of the Chinese cheapies. It got a "good enough" review from Dave Jones of EEVBlog. It only comes with one short Philips #2 bit. The long bit in my earlier photo, that you need to get in among the guts of a PIP, must be bought separately. Standard 6.35 mm hex drive. Hey guys,After reading the 71 pages, some of them twice, my interest has peaked enough to buy one. But where, is there an alternative to ebay? Can we buy a "voltronics" branded one? I would get one that meets all the required IEC or Standards. I would get one from an Australian supplier along as it meets all requirements for use in Australia. Like the one from www.giantpower.com.au. Having a warranty service in Australia is an advantage. Giant Power is used by a solar guru called Glen Morris (Australian Solar Council) in Australia for training people on Solar in Melbourne. If it is good enough for him it must be ok.
You would want to install it before the new draft "AS/NZS 5139 Electrical Installations – Safety of battery systems for use with power conversion equipment" comes into effect. Last edited by lopez on Tue, 25 Jul 2017, 14:29, edited 1 time in total. I tried a cordless screwdriver for screwing the buslinks down on my Li-Po batteries, but I find it's still a little too clumsy for my liking. It's easy to slip and make sparks in short order. But for everything else, like taking the side panels off the battery pack etc (where there's 25,000 screws) it's invaluable. 6mdx wrote: But where, is there an alternative to ebay? Ebay (via shop Maximum Solar) is pretty good. Quite quick shipping too. Being located in Taiwan, they seem to have good access to the developers. I have no association apart from being a satisfied customer. Can we buy a "voltronics" branded one? As far as I know, there is no such thing; they are all branded something else. It seems to be a choice by this particular manufacturer.